The United Nations Climate Summit takes place next week in Poland. About 20,000 people from 190 countries are expected to take part in the conference. There, world leaders will debate how to limit climate change -- the weather events linked to slowly rising temperatures on Earth. They will discuss ways to reduce carbon emissions and other pollution which, scientists say, can cause long-term changes to our planet. For environmentalists, one area of concern is South America’s Amazon rainforest. Studies have shown that the Amazon takes in as much as 2 billion tons of carbon dioxide a year and releases 20 percent of Earth’s oxygen. About 60 percent of the rainforest is in Brazil. Scientists wonder it will be protected under Brazil’s next president, Jair Bolsonaro. He takes office on January 1. Bolsonaro has said that his country should withdraw from the 2015 Paris Agreement. Under the agreement, most nations promised to reduce carbon emissions 37 percent over 2005 levels by the year 2030. The president-elect claims a mandate from voters to develop land for agriculture and other purposes. He said that Brazil’s rainforest protections are standing in the way of economic success. Scientists say deforestation is a major reason for climate change. Studies have linked rising temperatures to the destruction of forests. Scientists worry about the future of the Amazon. New Brazilian government records show the speed of deforestation has increased over the past year. Carlos Nobre is a climate scientist at the University of Sao Paulo. He told the Associated Press that it is almost impossible to say just how important the rainforest is to the planet’s living systems. Some scientists call the Amazon “the lungs of the planet.” They liken it to human lungs. Each tree takes in and stores carbon dioxide from the air around it. The trees also release the oxygen we need to live. 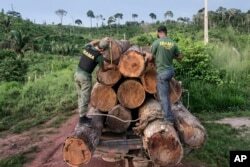 In this March 10, 2018 photo released by Ibama, the Brazilian Environmental and Renewable Natural Resources Institute, agents from Ibama measure illegally cut timber from Cachoeira Seca indigenous land in Para state in Brazil's Amazon basin. The Amazon, the world’s largest rainforest, also creates weather. Billions of trees pull up water through their roots. Then the trees release water vapor into the air. The vapor forms a thick mist, made up of tiny drops of water. These water particles move up into the clouds and later return to Earth as rainfall. Scientists estimate that the Amazon creates 30 to 50 percent of its own rainfall. During the election campaign, Bolsonaro promised to ease protections for areas of the Brazilian Amazon set aside for native peoples and wildlife. He said that indigenous lands and nature reserves restrict economic growth. “All these reserves cause problems to development,” he said. The president-elect also talked about taking away the power of Brazil’s environmental ministry to enforce laws for protecting the environment. Artaxo spoke to the Associated Press (AP). Bolsonaro’s team did not answer a request from the AP for comment. Some of Bolsonaro’s support comes from business and farming groups. One supporter, senator-elect Luiz Carlos Heinze, noted that farmers “are not invaders, they are producers.” He blamed the past administrations for supporting native rights at the expense of farmers. “Brazil,” he said,” will be the biggest farming nation on Earth during Bolsonaro’s years." Scientists warn that if the Amazon and other tropical rainforests lose too many trees, this could affect rainfall in other areas. Nobre and others estimate that the “tipping” point for the Amazon system is 20 to 25 percent deforestation. Without enough trees to support the rainfall, the longer and bigger dry season could turn more than half of the rainforest into a tropical grassland. That finding was published in February in the journal Science Advances. The Associated Press reported this story. Anne Ball adapted the report for VOA Learning English. George Grow was the editor.